Heard about our new range of Frozen Pizzas yet? We’ve taken 10 of our most popular pizzas & frozen them, ready for you to bake at home. Keep a stash in the freezer for those nights when you just don’t feel like cooking, or if you live too far out of town for take-away TGP. We’re now open lunchtimes (12-2pm) and evenings (5-8.30pm) 7 days, so you can pop in and grab one (or two or three) whenever suits you. It’s pretty gosh-darn frrreezing cold out there. Winter sure has arrived in Tenterfield! But our pizzas (and cosy little shop) are totally toasty and deliciously warm. 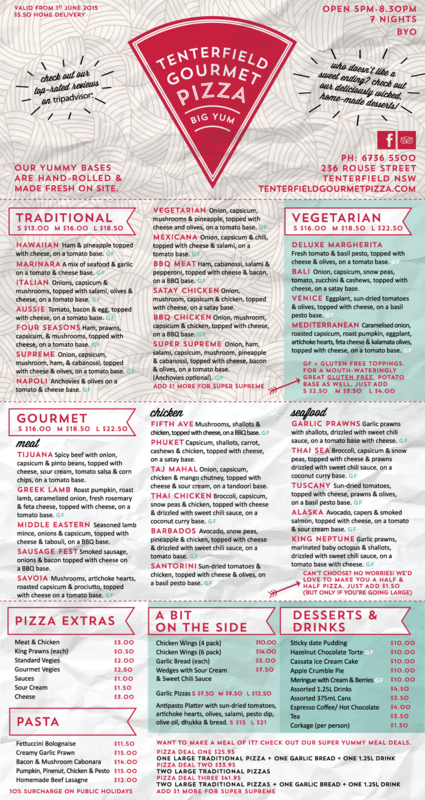 To see what’s on our newly updated menu, click on the ‘menu‘ tab, or see below. Many Apologies if you have been trying to get through to us to place an order over the last few nights and the phone has not answered. We have been having trouble with our lines but should have that fixed now. If you do encounter an engaged line over the weekend please try again in a few minutes time. We were closed last week for 4 days while we expanded our kitchen to double our oven capacity by adding 2 new stone pizza ovens. 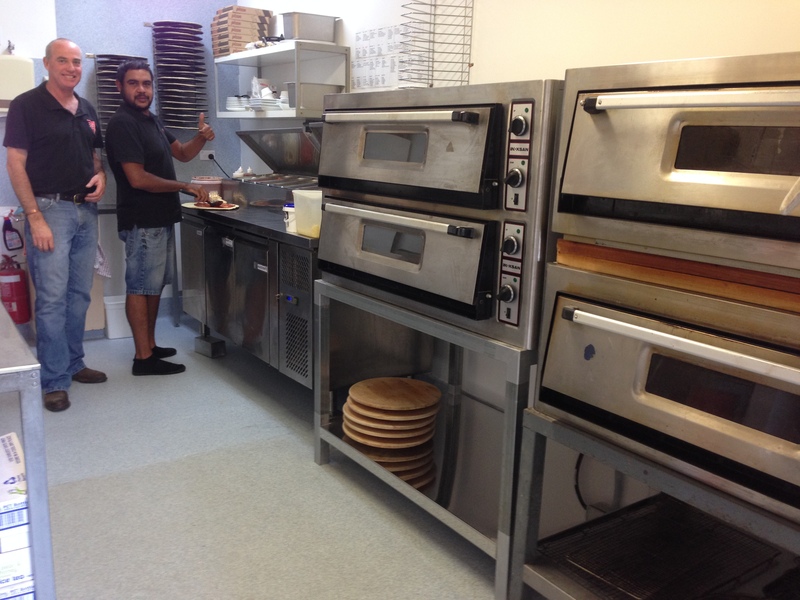 We hate to see people waiting for our yummy pizzas and this was the case on busy weekends so we carried out these renovations to make sure you can now get your favourite pizzas faster. We sometimes get asked if we do delivery.. sure do! $4.50 and we will have your order at your door step, before you know it. Just order ahead on Fridays and Saturdays when we get busy. It’s been really icy in Tenterfield lately. 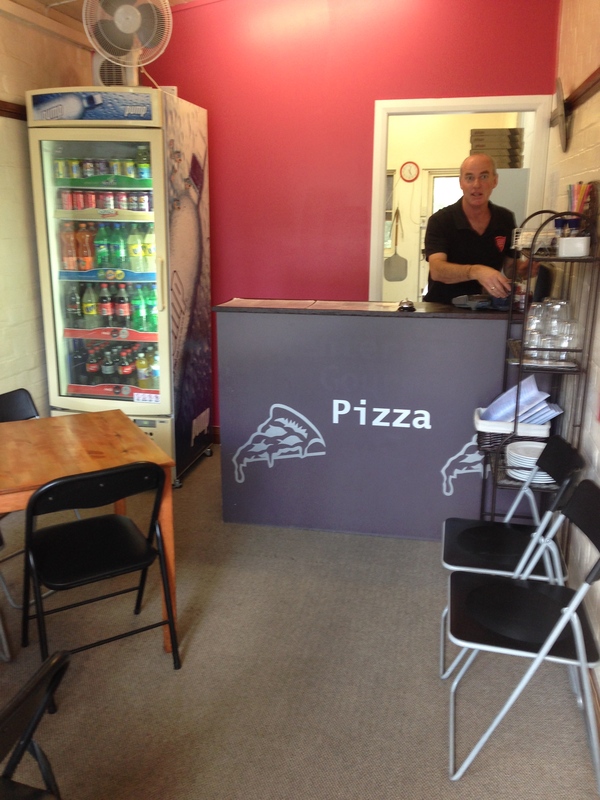 But at Tenterfield Gourmet Pizza you can be assured of a warm welcome, warm snug dinein area, and yummy warm pizzas and pastas to warm you right up. Have you tried some of our home made deserts lately? Maybe with a freshly made coffee? Whether it’s the Cassata Ice Cream cake, a sticky date pudding, a Torte or an Apple Crumble, we are sure you will find them all a great finish to your meal, or just a naughty little something to finish off your night on their own. All of you who have kids will be well aware holidays are on. And for everyone else, just a heads up that things have been busy at the pizza shop. So if you are ordering please phone in ahead as there has been a longer wait on delivery and pickups.